Royal Air Force personnel, villagers and family members recently unveiled a memorial to the crew of RAF Lancaster bomber ED 549 that crashed near Plungar, on March 5, 1943. 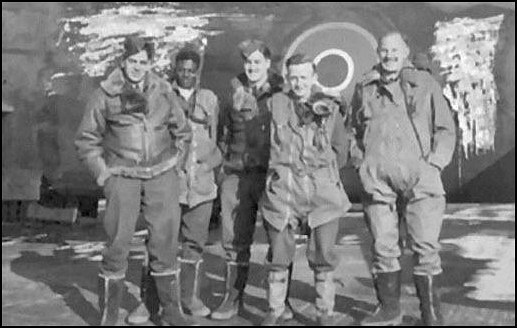 Six of the seven crew members died in the crash, including Barbadian Grey Cumberbatch. Grey Cumberbatch was the eldest child and only son of Charles WIlkinson Cumberbatch and Ocatavia Ceciliy Cumberbatch née Jordan, of St. Lucy, Barbados. He was born 2nd June 1921 and baptised 34rd July 1921 as Greystone Doyle Cumberbatch at St. Lucy Parish Church. He died 5th March 1943, aged 21, when his Lancaster bomber went down returning from a mine-laying mission over the French port of St. Nazaire – a wartime base for German submarines. Second contingent. Cumberbatch is front row, left. Barrow is back row, right. 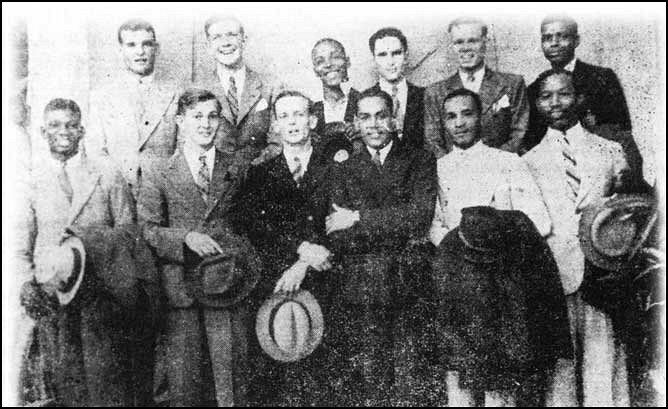 Cumberbatch had volunteered for the RAF and was part of the ‘second contingent’ going overseas that included the future first Prime Minister of Barbados, Errol W. Barrow. Thanks for Posting this! Seems two of his crew members were Canadians. 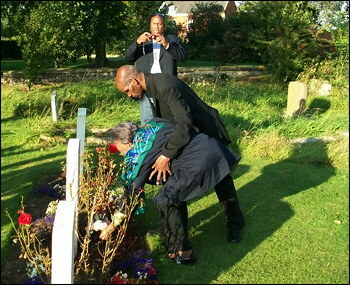 Would love to hear more about Bajans in the Second World War. This is a site about participants from the Caribbean. Thank God for people like him who protected the world from Hitler’s agenda. The Lancaster was a dangerous bird to fly. Check out the statistics for crew survival rates vs the B17 and B24. When a bomber was hit, the crew of a B17 or B24 could bail out through many large hatches. The front office crew of a Lancaster had one tiny little hatch under the nose. The difference in survival rates is staggering. Read ‘Tail End Charlies’ the book. I will be forever greatfull to all those who gave so valiantly that I have the freedom to be who I am and do what freedom allows me to do what I desire to do. Grey Cumberbatch was a member of my family. It is wonderful to see that his memory is being kept alive. May God’s blessings be with all the families of Leicestershire Village. Thank you for taking care of his grave all these years, we know that he is not forgotten. Update : It was confirmed by the sister of Grey Cumberbatch that the altar-communion rail at the Church was indeed donated by their father, C.W. Cumberbatch.